Three misfit students are the only survivors after evil aliens attack their ninja academy. Their ninja master endows them with the power of the legendary Super Megazords and Power Rangers: Ninja Storm is born, ready to save the world one more time. The Ninja Battle Power Rangers are equiped with armor changing features with a push of a button in the back. Rangers also have an action feature when their legs are squeezed together. 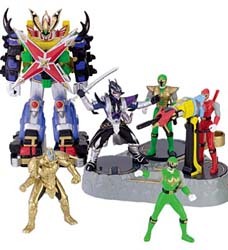 Collect all six Power Rangers and combine their action figure forces together to create one mega-force.